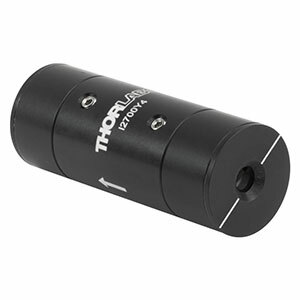 Thorlabs manufactures a wide selection of narrowband and broadband free-space optical isolators (Faraday isolators) that operate in spectral ranges from 365 nm to 9.80 µm, including high-power options, as well as fiber isolators designed for wavelength ranges from 650 to 2010 nm for polarization-independent versions and 770 nm to 2010 nm for polarization-dependent versions. For customers whose needs are not met by our stock selection, we offer a custom isolator service that can combine the best features across our entire isolator family. The Optical Isolator Selection Guide displays wavelength ranges and isolator types for all stocked isolators.